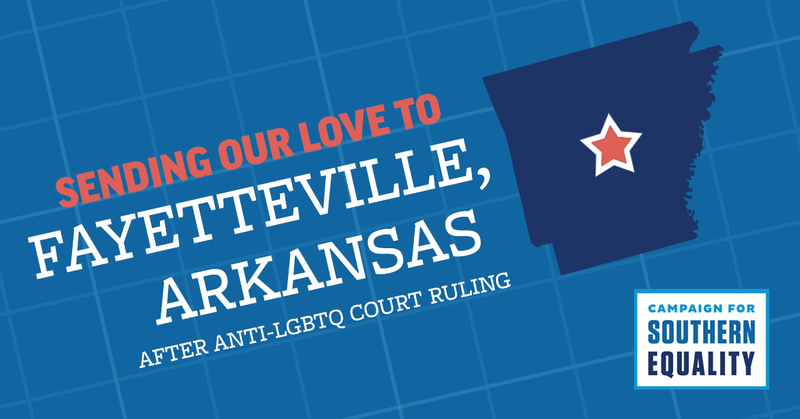 This week the Arkansas Supreme Court ruled against LGBTQ nondiscrimination protections in Fayetteville, an outlier ruling from a long line of court decisions in favor of LGBTQ-inclusive nondiscrimination protections. The Arkansas Supreme Court found unanimously that the city of Fayetteville, AR could not enforce its 2015 nondiscrimination ordinance while a legal challenge to the constitutionality of the ordinance proceeded. In 2017 the Arkansas Supreme Court also ruled against the ordinance, which voters in Fayetteville supported by popular vote at the ballot in 2015. The case stems from a 2015 law passed in Arkansas and signed by Republican Governor Asa Hutchinson. The 2015 law, SB 202, preempts cities and towns from passing nondiscrimination policies that are more expansive than the state-level nondiscrimination law. Since Arkansas’ state law excludes any mention of discrimination based on sexual orientation and gender identity, cities and towns are essentially barred from taking a stand against anti-LGBTQ discrimination at home. No one should face discrimination because of who they are, and cities and towns should be able to protect their residents from discrimination targeting LGBTQ people and others. Arkansas’ SB 202 – as well as similarly restrictive laws preempting nondiscrimination ordinances in North Carolina and Tennessee – should be struck down so that municipalities can do the right thing to protect LGBTQ people.